This has been one of the best years for the sport of boxing for quite some time. Throughout 2017 there has been a throwback feel to the bouts that have been made within each division, with the best finally facing off with the best. From heavyweight battles to welterweight scraps and super-flyweight epic encounters, there has been an abundance of incredibly enthralling bouts to have taken place. And there’s much more yet to come for the remainder of the year too. Unified heavyweight champion Anthony Joshua has become the biggest star of the sport and his outings in 2017 have been huge, while the biggest battle of them all between Saul ‘Canelo’ Alvarez and Gennady Golovkin was finally fought out. But, with so many more intriguing match-ups just around the corner, there’s further drama and excitement set to unfold within the ring involving some of the best fighters in the world. So, here are four anticipated bouts still set to take place at the end of what has already been a sublime year for boxing. The final hurrah of legendary Puerto Rican fighter Miguel Cotto is one not to miss as he attempts to bow out on a high with a victory over final opponent Sadam Ali. After an illustrious career which has spanned an impressive 16 years, the four-weight world champion will seek to ride off into the sunset with a defence of his currently held WBO light-middleweight title. Cotto and the rest of the big names that are set to feature at the end of 2017 can be backed through several promising free bets available from Oddschecker. In August Cotto won the 154lbs strap with a vicious display and victory over Japanese challenger Yoshihiro Kamegai, and another supreme performance in his last outing would be a perfect ending to his long-standing career. Next up is the big one for boxing purists, as two double Olympic Gold medal winners square off for the first time in history. Vasyl Lomachenko and Guillermo Rigondeaux are regarded as two of the best amateurs ever to take to the ring. Their unique respective skillsets set them apart from the rest in their divisions, but it’s Lomachenko who has shot to stardom since bursting onto the professional scene. He set the record for least fights to become a two-weight world champion, achieving such a feat in an incredible seven outings. Meanwhile, ‘Rigo’ has been widely avoided at super-bantamweight so he is moving up to tackle the Ukrainian star in what is arguably the most intriguing bout of the year to date. This decisive encounter takes place at The Theater of New York City’s Madison Square Garden. From super-featherweight up to middleweight next and another fascinating match-up between Billy Joe Saunders and David Lemieux. The former is currently the 160lbs WBO champion and successfully defended it last time out against Willie Monroe Jr in London once again. But this time around he travels to away territory of Canada to face a fearsome puncher in home hope Lemieux, who will enter the ring on the back of four straight wins since his brutal defeat at the hands of middleweight kingpin Gennady Golovkin. Saunders possesses the ring IQ and movement capable of outdoing the Canadian over the stretch, while Lemieux is a dangerous knockout artist that can end proceedings at any moment. Those ingredients make this an unmissable middleweight meeting in Quebec. 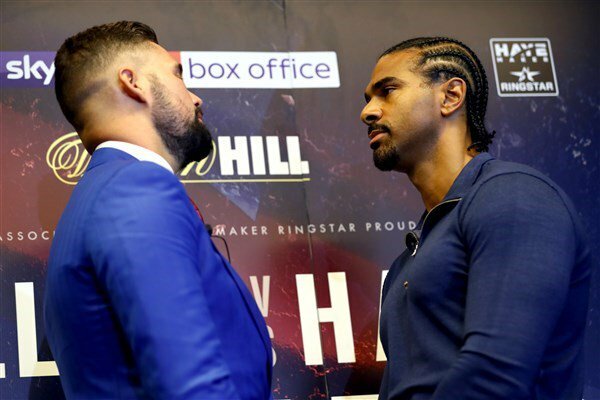 When Tony Bellew and David Haye first met in London earlier in March, it was the former that somehow prevailed following an unfortunate mid-fight injury to his opponent. Former heavyweight world champion Haye ruptured his right achilles tendon during proceedings and later underwent surgery. Bellew was awarded an 11th-round stoppage success and agreed to a rematch, which will once again be shown on Sky Sports Box Office. It may not be the biggest fight of 2017, but based on the drama and build-up of the first, it’s surely set to provide even more mayhem when the pair go at it once again in the capital. A win for Bellew would likely end Haye’s long-term career as well, as the Londoner aims to eventually go toe to toe with current superstar Anthony Joshua further down the line. Be the first to comment on "Four promising fights still upcoming in 2017"